[deleted post]I agree the BB OS has much going for it and needs to be supported. Lets hope they can deliver on the hardware as the OS is certainly superior. I think the actual advancements are slowing down. That is, the new top end mobiles have really only small incremental increases in advancements, and usefulness, and for which everyone is ranting on about. I would not bother to spend the money. Why buy a S5 when you can get a S4 online for about 60% of the price. Makes no sense to buy an expensive mobile if paying cash. Only get if the carrier will offer them to you as a cheap upgrade package, otherwise forget them and buy them in 12 months at a much cheaper price. THE CAMERAs SHOULD BE A "TIE"
since LG G3 do better at night. and S5 is slightly better in daytime. sonic03, 19 Jun 2014what was the point of this "Contrast, colors, and sunlight legibility all factor into ... moreI agree. I was very confused by their conclusion as well. can every just stop arguing ? just buy your favorite phone, ok ? AnonD-239468, 19 Jun 2014+1 Great comment Sir, especially the last few lines.Thank you very much, sir. Anonymous, 19 Jun 2014Still rambling about things you have no knowledge of. LCDs are over saturated too. And LGs ip... moreDid you not read his comments or are you just a fan of putting words in other people's mouth? He already said G3 had a bad screen. Worse than HTC (BEST!) and worse then Sony. Just not worse than Samsung. 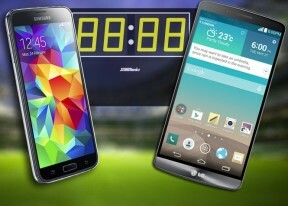 Anonymous, 19 Jun 2014why you so much desperate in comparing s5's display to lg g3's? samsung is busy in making a... moreHe probably works for Samsung. In display dept. He should be fired! Anonymous, 19 Jun 2014Still rambling about things you have no knowledge of. LCDs are over saturated too. And LGs ip... morewhy you so much desperate in comparing s5's display to lg g3's? samsung is busy in making another phone to compete with g3! AnonD-80553, 19 Jun 2014700 nits is nothing against the sun's powerful 7,000 to 10,000 nits. Hence the S5 is still cra... moreThat has no logical ground at all. Larger display is a preference of people. And G3 entered phablets. Plus it does 0.4inches more does not fix how much dimmer or more reflective it is. Does not matter if it beats the sun or not. The point is it's above what the others have and a decent bit above LG. You try to deny what the S5 can do in defense of the G3 while exaggerating on G3....how logical. AnonD-80553, 19 Jun 2014Fact and reality is one gets a bigger screen, which is also brighter under normal (indoor and ... moreIt's still not actually brighter. And even for indoor levels that's a small difference that still favors Amoled'A mole D'Souza advantages. Plus they tend to have higher perceived brightness. If you want to try and argue facts. AnonD-80553, 19 Jun 2014Sunlight visibility on just about all phones, including samsung's amoled, are a joke. It's bee... moreStill rambling about things you have no knowledge of. LCDs are over saturated too. And LGs ips displays are among the most saturated. ... so your point is competent and 100% irrelevant and flawed. Now to further debunk it....not only are they over saturated but they have generally less evenly calibrated colors than Samsung's Amoled displays. They have fake blacks and washy contrast on the best of the best. Their white balance is almost always way too warm. They are more reflective. They generally have uneven lighting with bright spots. More leakage. They consumer overall more power and space as well. But ooooo....the colors are "less" over saturated. Congratulations.